Close to a year after their Madison Square Garden debut, Led Zeppelin returned for the big New York show on September 3rd on their seventh North American tour. With a sell out in three hours, playing to a packed Garden insured a legendary performance and in addition to performance, this show is legendary in other ways as well. Three tape sources exist for this concert. Despite the constant talking and comments made by the taper and his friends, this is clear and enjoyable recording which captures the insanity in the venue that night. Previous releases of the tape include the no label Hard Company and Mad Screaming Gallery (Lemon Song LS-7203/4/5), both of which offer the complete concert. The announcer begins the show by stating that Led Zeppelin won the Melody Makerpoll in England for most popular group as the band comes on stage and before they even play a note Plant greets the audience with “how’ve ya been?” several times. The torrent of notes of “The Immigrant Song” drives the sellout audience nuts and before “Since I’ve Been Loving You” Plant has to do some crowd control, saying, “Listen, the one thing we don’t want tonight is a lot of rapping when we’re trying to play. So if everybody, if you respect the people behind you then we’re gonna stop a lot of shouting. So try to move into the aisles, and sit down a bit, otherwise it’s gonna be us that are going to suffer.” The first new song of the evening is “Black Dog,” which the taper has trouble hearing the song title and needs help from his girlfriend. “Dazed And Confused” is one from a long time ago and features the Bouree in the violin bow episode. Jimmy Page invents several unique riffs during the song’s twenty-two minute duration. The paradigm for all versions on this tour is from the BBC recording the previous spring, where the arrangement still has a solid foot in psychedelia (an aesthetic which would be dropped by the time they tour Japan). 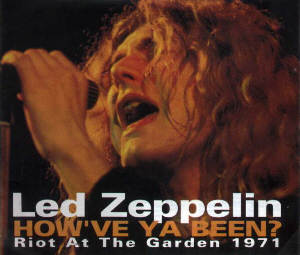 Plant expresses surprise at the audience afterwards, saying “we didn’t even imagine it was gonna be like this.” He tells the audience to be quiet for “Stairway To Heaven,” saying “if you’re gonna talk, whisper.” Unlike the Los Angeles performances, Plant doesn’t make any mistakes in the words and the song comes off without a hitch. The audience (near the recorder at least) don’t seem to pay too much attention to the song until it speeds up with Bonzo’s entrance. “Celebration Day” is a “tribute…to New York” and makes its New York debut. The acoustic set is only two songs long. “Last time we were here, when we sat down, we didn’t have much success doing what we were doing cause there was so much noise” Plant remembers, referring to the 1970 shows were there was much talking. Things haven’t changed much since. In “That’s The Way” Plant sings “and yesterday I saw you walking by the Hudson” to add some New York flavor. “Whole Lotta Love” is tremendously exciting. After they come back for the second, Page plays the opening riff to “Train Kept A Rollin’” as Plant again tells the audience to be quiet. But when Jones begins the organ solo people begin to climb onto the stage. Eyewitness say the band stood on the monitors to be seen by the audience. People by the taper keep shouting “get off the stage! !” By the time “Thank You” starts so many had climbed onto the stage that it cracks. The noise is very loud. How’ve Ya Been? : Riot In The Garden 1971 is an early TDOLZ release which sold out soon after its release and is extremely rare, commanding high prices when it does occasionally surface. The sound quality and completeness is much improved over the older titles. TDOLZ released this in 1996 and the tape has not been pressed to silver since making this by default the definitive version.